“Visualization” is one of the driving trends in AV-based collaboration today, with the goal of providing participants with display-rich environments where everyone can truly ‘see’ what is being talked about. 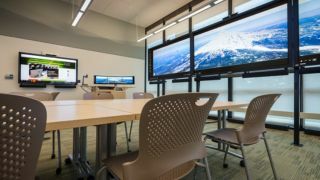 The new Decision Theater at Portland State University’s (PSU) Market 123 building in Portland, Oregon, is a stunning example of how far visualization-based collaboration has come. Designed to serve AV-centric classes, and also meetings between PSU researchers and regional stakeholders, the Decision Theater uses large displays to visualize data sets in areas such as forest fire prediction and prevention, for example. Translating these data sets into large screen visuals helps researchers see patterns hidden in the data, and make informed decisions based on these insights. Making all this possible within the PSU Decision Theater are seven large InFocus ‘Mondopad’ all-in-one interactive full HD videoconferencing and white boarding system with powerful onboard PCs. Three 80-inch Mondopad touchscreens are lined up side-by-side along one wall as an integrated visual unit. Four Mondopads are distributed on the Decision Theater’s other three walls. All of the monitors can display single and multiple windows, using feeds managed by the Extron control system located at the Decision Theater’s podium. Because the Mondopads come with built-in Windows 10 PCs, each touchscreen display can be used as a control surface to access, call up, and alter visual data stored on PSU’s local network, or access this data externally via the web. The Mondopads also support videoconferencing in the Decision Theater, because they are equipped with cameras and speakers, and connectable to the outside world. Collectively, the seven Mondopads provide Decision Theater participants with a 360-degree view of data and imagery. They can visually immerse themselves in their work — and interact with it — as much as they need to. The impetus to build the Decision Theater began in 2012, when the university decided that it needed a collaborative space that would aid both students and researcher/stakeholder sessions. It was at this point that PSU decided to use InFocus Mondopads in the Decision Theater. “We were already familiar with the Mondopad technology, having installed these touchscreens in various PSU class and meeting rooms over the years,” said Hatfield. For the record, the InFocus Mondopad line of products include interactive touchscreen and business-class displays/video conferencing systems range in monitor diameter from 57- to 85-inch. The displays include built-in networkable Windows 10 computers, capacitive touchscreen technology, and digital interactive whiteboard/document annotation. When connected to an Ethernet network and incorporated into an AV-rich switching environment, the Mondopads provide users with highly capable smart monitors, controlled by direct contact with their screens and/or connected switchers. Beyond the seven Mondopad monitors, the Decision Theater’s AV system built upon an Extron core. “We have a futureproof Extron DTP CrossPoint 108 4K matrix switcher, which handles the feeds going to and from the Mondopads,” said Hatfield. The DTP CrossPoint 108 4K switcher comes with four DTP inputs, six HDMI inputs, four HDMI outputs, and four independently scaled DTP outputs. According to Extron, this switcher’s integrated DTP inputs and outputs “support transmission of video, control, and audio up to 330 feet (100 meters) over a shielded CATx cable”, more than enough to support all of the equipment within the Decision Theater’s footprint. This is connected by Cat 5 cable to seven Extron DTP HDMI 4K 330 RX Long Distance DTP Receiver for HDMI, one for each of the seven Mondopads. Audio to the displays and the room’s speakers is managed by an Extron RGB-HDMI 300 A RGB and stereo audio-to-HDMI scaler, with audio reinforcement coming from an Extron XPA 1002 200-watt stereo amplifier. The Decision Theater is equipped with four TOA 6.5-inch co-axial ceiling speakers, while the session leader can make themselves heard using a Sennheiser EW122 G3 wireless lavalier microphone system. The Decision Theater’s AV system is controlled at the room’s Klasstech podium using an Extron TLP 1000MV 10-inch touch panel. An Aver Media M70HD document camera, Denon Bluray player, and three side-by-side Dell UltraSharp U2414H 24-inch monitors on an Ergotron DS100 triple monitor stand are also located on the Klasstech podium. Fitting all of this technology into the Decision Theater was a major challenge. “First, we had to search the campus for a room large enough to serve as the Decision Theater,” said McCartney. “Once we had settled on the Market 123 building, we had to make sure that the room we used wasn’t crowded out by equipment.” Fortunately, careful layout by James Hatfield and the PSU team resulted in a collaborative space that feels open and uncluttered. Today, PSU’s Decision Theater is providing unparalleled visualisation capability in its many users. In addition to the room’s ability to provide students and professors with exceptional AV-aided education, the university “now has a high-performance, multipurpose room for researchers and community members to easily visualize data and complete individual or group work, while collaborating with others, both on and off campus using the video conferencing system,” said Glenn Jystad. “We very much got what we planned for,” added Doug McCartney. James Careless is a regular contributor to AV Technology magazine.